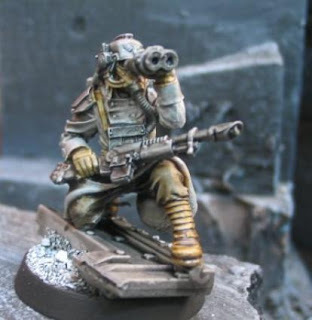 Picture: a Death Korps of Krieg model. Part of this balanced breakfast. This is a complete line of models from Forge World. It’s a slow news day in Game Land today. Pretty much just catch up. The bitz wall is all sorted out, which is unusual. Think about it. With an army a day coming through that’s a lot of extra pieces. So we make a lot of money on that, right? Nope. It’s actually a monthly expense to get it all sorted. But we keep it because it allows us to do really cool conversions on your projects. Also, we are now taking terrain projects. 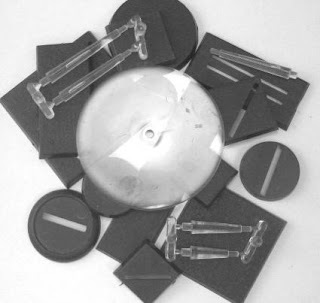 Cost is $200-400 for a densely packed table (that can also regularly pack two tables). 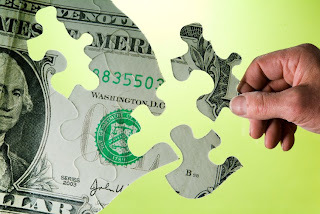 You set the budget and set broad parameters. I will be glad to trade bitz or kits for them and also to credit for a project you might have cooking. Picture: a Steam Dwarf from Rackham. 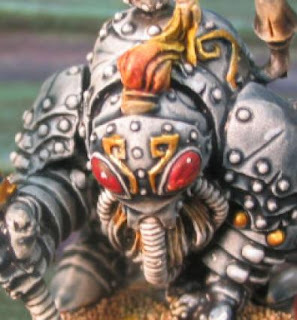 I loved these models and painted up a whole bunch many years ago. I wish I could get more. We are proceeding apace on all projects. There are three projects in digital photography, those should be through tomorrow (Tyrion, Fantasy Figures, and Black Templars). I have a bunch of figures coming through for D&D. I’m being smart and looking forward to resale. Today it was ghouls, hounds of khorne (used as hellhounds! ), two nephilim from Hordes, and a dark elf hydra. The studio Dark Elf army is almost half collected. They will be doubling as Drow down the line. In fourth edition D&D a single Drow could wipe out a party of low-level adventurers (well, maybe a few Drow. The Hounds of Khorne are going to play a dual role in the Wyches of Thoth army. These are steadily getting filled. I am laser beam focussed on getting them filled up before July 31. Maybe I’ll get a day off! By all means contact me if you’d like something done. We went to play miniature golf for FHE last night. Griffin grabbed a low lamp and burned his fingers really badly. It was tough to see him suffering last night, but after tending and comforting him for some time he finally nodded off and had a good night’s sleep. He was feeling much better this morning and running around like a baboon all day today. He has four large blisters, one on the tip of each finger. That light was hot as an iron (we have resolved the matter with the proprietors of the establishment, by the by). My wife is making apricot jam, a yearly ritual. During the year we use it to break the ice with new people who move into the neighborhood. 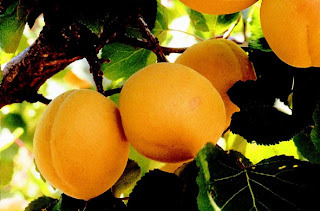 She brought home like two laundry baskets full of apricots to make it from, and yet the boughs are still laden. I had a bit of a revelation today: I think my progress in life is just about right for my age. I need to stop my hand-wringing. Life is good. I am going fishing with Jonah later this week. I’m looking forward to that. Oh, a PS about Griffin’s burnt fingers. He keeps that hand tucked away in his pants leg (not on his crotch mind you), but he looks like a little Al Bundy running around the house. We had a family from the ward over for dinner. This was the same family who watched our kids while we were at Adepticon. I don’t know if I told you this back story, but when I went to pick them up the mother of the family told me that Jonah and “Kimball” were kissing. My first question, “Is Kimball a boy?” Thankfully, no, sparing me that particular conversation. Just this absolute cute button of a girl. Well, we put an end to that (as adorable as it might be), and evidently Kymble was crestfallen when told the rule would still be in effect for today’s visit! We had hamburgers, hot dogs, and salad. You know, typical american fare. Boy, I could go for another grilled hamburger right now. After dinner we went for a walk around the neighborhood, a temperate and overcast summer day. We ran into a variety of characters from the ward. I just wanted to say thanks for taking such great care of me with my 4 projects. Everything you guys have done for me up to this point has met or exceeded my expectations. It’s rare to find a business that always does better than expected. You run a first class operation, and even with the issues of owning your own business the product never suffers. I commend you and your staff for a great job. Please let me know if you ever need anything from MyHighSchoolLocker.Com or Diablo Bats. I would be honored to help you out. Have a great week, and I’m sure we will talk soon. Skies near Provo from here. Here is my humble offering for this Sunday. For those just joining the program, Sunday is for non-game-related topics. Sort of an open mic. My first year teaching, I travelled between classes doing ESL and Spanish. In one fourth grade class there was a girl named Angel who was renowned for world-class tirades. However, whenever I would show up, she would move to the front of the class and pay close attention. I’ve come to think of church more as a dress rehearsal. It’s practice. Sort of like practicing a pose hoping that it will “stick”. Each time my life gets a little better. I leave inspired to improve myself, with ideas to be more Christ-like. C.S. Lewis wrote that Christianity is like whitening toothpaste. Sure that brother’s teeth may still be yellow, but how yellow would they be if he didn’t use the toothpaste? And that’s true of my life. Sure, my character may be full of holes. But you haven’t seen in vision the Shawn that I could have become had I not been using the whitening toothpaste. He lives in a urine-smelling apartment with a single bare light bulb, a rank alcoholic, dodging the police and back child support. So, I thank my grandma Laurie for sending me to “bible camp”, and Pastor Anderson who first led me to read the New Testament, and to the two LDS Sisters who knocked my door back in 1985. The Savior didn’t heal people of the common cold. He only took on hopeless cases; lepers, blind, lame, deaf, and (in once case) even dead. That was to make a point. There are those (like me) who have spiritual leprosy. “But that thou see that the Son of Man hath power also to forgive sins, I say Rise, take they bed and walk.” [paraphrase, read the whole thing in Mark 2]. I leave you, noble reader, this day with a word of encouragement: keep your chin up! And lastly with these quotes from On Being Worthy, one of my favorite talks. Perhaps we all live under some misconceptions when we look at each other on Sundays as we attend our meetings. Everyone is neatly dressed and greets each other with a smile. It is natural to assume that everyone else has his life under control and doesn’t have to deal with dark little weaknesses and imperfections. There is a natural, probably a mortal, tendency to compare ourselves with others. Unfortunately, when we make these comparisons, we tend to compare our weakest attributes with someone else’s strongest. For example, a woman who feels unschooled in the gospel may take particular note of a woman in her ward who teaches the Gospel Doctrine class and seems to have every scripture at her fingertips. Obviously these kinds of comparisons are destructive and only reinforce the fear that somehow we don’t measure up and therefore we must not be as worthy as the next person. We need to come to terms with our desire to reach perfection and our frustration when our accomplishments or behaviors are less than perfect. I feel that one of the great myths we would do well to dispel is that we’ve come to earth to perfect ourselves, and nothing short of that will do. 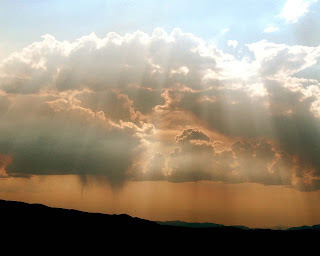 If I understand the teachings of the prophets of this dispensation correctly, we will not become perfect in this life, though we can make significant strides toward that goal. Picture: a Wargods of Aegyptus Khemru by http://www.crocodilegames.com/ I’m a huge fan of these models. They are very, very nice. So, what’s new at the studio? We are caught up. Well, I don’t mean all the projects are done. Everything is proceeding apace and the studio is clean, organized (eg all the bitz sorted, pics taken etc.). It’s a good feeling. I have a single painter with no work to do and it is really bothering me. I have ordered some Legion of Everblight models to use in the D&D game. I’d like to say a few things about fourth edition D&D. It’s a great miniatures battles game. It easily converts to non-grid without really any thinking at all. And it is a ton of fun. One of the things I like best are minions: they go down in one hit, just like in the movies. 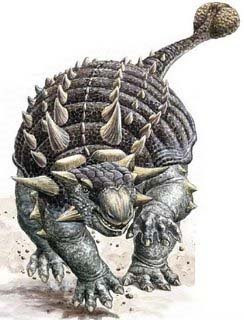 It is very satisfying to run them and also to beat the crap out of hordes of them. Another thing is that Hit Points are now more like cinematic stun damage. You can get your “second wind” once per battle and heal up 1/4 HP without any healing spells. The bottom line is that it keeps PCs in the game and makes other things more important like “conditions” (eg stunned, dazed, immobilized). Basically, the creators of the game just made is more abstract and more fun. It worked spectacularly. Our group is painting like 20-40 new figures a week for the game. I am doing this with an eye for sale-ability down the line. I want to be able to use then in a game of Warhammer Fantasy, too. Speaking of which, I threw down the gauntlet for Mike’s Orcs. I’m working steadily on the studio Dark Elf army. 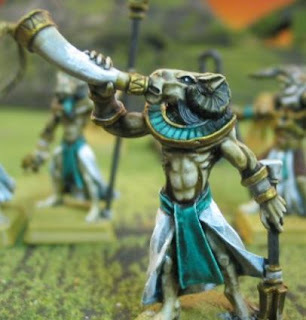 Models for the Witches of Thoth (40k Daemons army) are coming in on Monday. I am still looking to sell the Dragons of Moloch. I have also sold almost every model in the studio. Out with the old and in with the new. You’ll notice that the For Sale section of the website has been all but completely cleared. With things in hand at the studio (other than lining up projects as much as I would like), I am able to actually spend some time with the family. I went to swim lessons with the kids this morning. Griffin is having trouble standing in line as usual. This evening we went to a swim park at a neighboring city, but lightning in the distance forced the pool to clear out no less than two minutes after we got there. The kids were ever so disappointed, so we crashed a friend’s house to use their pool. That was quite a special time; giving the children “turtle rides” and throwing daddy into the deep end. The kids are happy, healthy and confident. 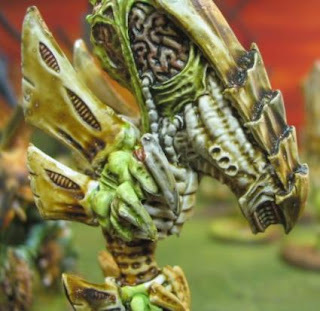 See more of these Tyranids. Today (OK, I’m writing this on Friday, just indulge me with a little time travel) was Pioneer Day in Utah. This is pretty much as big as July 4 in Utah. We went to the parade in the morning. We usually just sit out in front of my business. I went with Kenna to a burger joint for a smoothie and some greasy breakfast. My sister-in-law’s family stayed with us overnight and the kids really enjoyed their cousins, who are mostly their own age. We had to put them to bed like ten times. Finally, I split them into different rooms. I am 90% done with Obama’s book. It was a good read. I also got a hold of a hardback of John McCain’s “Faith of My Fathers”. Reviews on both items forthcoming. Your army is welcome here. We are pretty light right now, so projects can get immediate attention. It has been a week now since receiving my finished Winter Eldar army. It sits idle in my display case with lights a glow the green canopies and light fades with the blue to white on the wings of my beautiful flyers. I’ve had a few people ask me about it already, “Wow, what are those?” my typical response are “just my minis”…. Now my response is “My army with which I will take over the world”. Anyways, people are already praising the paintjob and the unique color choices and style. The Army really flows well, the colors through out just Superb. That Green Glow of the Prisms and Canopies reminds me of Absynthe. So yes, the army is intoxicating. I can not believe how quickly the process was, shipped and less than a month later it was done. I applaud Shawn’s Selling skills and ability to brainstorm to death over the telephone leaving the client … wanting more and more. Great Job! And to whoever packed my army (the shipping crew?) packed it really well. HolyMoly- it took me 2 hours to unpack the army and there was only 1 item that separated in transit (nothing a 1/8th brass rod couldn’t fix). Lastly I would like to thank the Artist on this job, I asked for a congruent army, seeing as I haven’t been able to paint one myself for 10 years, and you did a fantastic Job. Leaving the artist up to choosing the palette and going with that flow I thought I was putting my life in some else’s hands, luckily his reputation speaks for itself and he did a great Job. 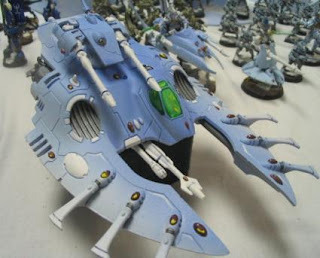 Your creativity and originality really makes the Winter Eldar Skyhost 01PP a perfect example of what can be done by BTP. Congrats on a Job well done. I hope you have continued success for many years to come. If you could imagine I am already putting models aside for the next installment. This week I decided to put the fourth edition rules to the test and have a battle royale. The party returns to the fray to the south of Winterhaven, in the farms and fields. Tarvis dumps Delphina with an old farmer coot in his “kobold bunker”. “They said I was crazy to build it, but who’s crazy now, heeheehee!”. And of course the four Heroes! It was a close one, but the heroes prevailed. If you’re under 0 HP you roll every turn to see if you are getting deader or staying the same. On a 20 you actually get back up! After a brutal beating, Renn’s Dragonborn Fighter finally went down, but stood up the very next turn! It was astounding.